Should composers ever see their fame wane over the course of time, the music industry can be relied on keeping their memory alive. In our young twenty-first century, we have, in fact, already seen a host of events celebrating the anniversaries of many musical masters: 2006 marked the global jubilee of Mozart’s 250th birthday, as did 2008 of Puccini’s 150th and 2010 of Schumann’s 200th anniversary. Such commemorations traditionally result in an outpour of renewed interest in the celebrated composer, be it in the form of CDs with musical oddities, grand concerts or academic publications. In 2013 we witnessed yet another hard to miss remembrance: Richard Wagner’s bicentennial (1813-1883). All over the world institutions, universities and opera houses alike paid tribute to the master of Bayreuth; only the ‘Grüne Hügel’ itself, it seems, wanted to avoid the celebratory fuss by keeping the Villa Wahnfried closed to pilgrims and other devotees for restoration. 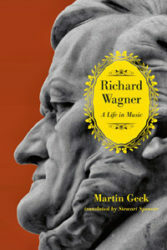 One such remarkable contribution midst the plethora of festivities is Martin Geck’s Richard Wagner: A Life in Music, recently translated into English by Stewart Spencer. Remarkable, not only because of its ambitious outset to summarize the musical achievements of Wagner within the confines of one book, but also because of the often surprising entwining of life and art it manages to uncover. If the name of Martin Geck sounds familiar; one could know him from his book Robert Schumann: The Life and Work of a Romantic Composer, which he wrote in light of the Schumann year in 2010. In Richard Wagner: A Life in Music, Geck continues in the same vein by focussing on Wagner’s musical oeuvre and approaching it through his philosophical and aesthetic mind-set. He does not only aim to address the underlying structure and effect of the separate musical dramas, but seeks to plumb the lasting influence that Wagner’s music exerted on the generations and decades to come as well: ‘[I]t is not Wagner that I want to figure out but myself and my age’ (Introduction, p. 16). This approach is met with certain difficulties and pitfalls, but all in all the ambitious outline of Geck’s study on Wagner makes for a compelling blend between biography and musical analysis. The different chapters, which chronologically discuss each separate drama of Wagner, all follow a similar pattern. First, each chapter sketches the relationship between the work and the reigning Zeitgeist as well as Wagner’s aesthetic beliefs. Subsequently, it summarizes the content of the given work and explores some of its thematic features or peculiarities. In the concluding part of the chapter, Geck analyses musical excerpts of the dramas and he probes their function within the Gesamtkunstwerk. Additionally, short interludes between chapters feature portraits of notable Jewish figures who are in some way connected to Wagner. These accounts range from contemporaries like Meyerbeer and Heine, composers such as Schoenberg and Mahler to thinkers and artists influenced by Wagner, such as Eisenstein or Adorno. The book’s multi-faceted approach offers a dynamic and thorough, though not always fresh perspective on Wagner’s oeuvre. In the second half of the study, the music-centred approach probably yields its best results. The analysis of Der Ring des Nibelungen – spread across four chapters – for instance, succeeds in presenting a varied yet coherent take on the majestic tetralogy. Especially with regard to Das Rheingold, the ‘Vorabend’ of the cycle, Geck brilliantly describes the textual, musical as well as theatrical mechanisms with which Wagner depicts the advent of moral imbalance in the world. On the same account, the chapter about Die Walküre shows how Geck’s minute attention to detail results in fine-cut, surprising observations about pieces of art which make up a staple part of our cultural memory. This challenge should not be underestimated and is not always tackled successfully by Geck. In the chapter on Lohengrin, for example, he discusses the thorny issue of the appropriation of Wagner’s storyworlds by the Third Reich. Based on circumstantial and anachronistic arguments (e.g. the fact that Lohengrin calls and appoints Duke Gottfried as ‘Führer’), Geck deems Lohengrin ‘incapable of concealing its affinities with nationalism and National Socialism’ (p.108). The nature of such affinities is stretched out to an implausible degree in this way and by retrospectively over-indicting Wagner’s role in the course of twentieth-century events, he eventually fails to address the issue deservingly at all. Even the intermittent portraits of notable Jewish figures seem to feature the individuals as token martyrs in order to rectify atrocities of our past, rather than approaching the subject of Wagner’s anti-Semitism in an equally critical and nuanced way as Geck succeeds in doing with regard to other matters in his study. Martin Geck sets out to weave a teleological thread throughout his book. Through the adage of ‘redemption through destruction’ – which according to Geck occupies centre stage in all of Wagner’s dramas – the book brings together Wagner’s whole oeuvre under the umbrella of artistic consistency and continuity. The attempt is certainly valid and commendable, as it helps to explain certain contradictions in Wagner’s life such as the revolutionary and utopian socialism he adhered as Kapellmeister in Dresden in contrast to the elitist aura of Bayreuth thirty odd years later. Be that as it may, we risk to encounter a contrived image of the composer’s career. In the first chapter, for example, Geck treats Wagner’s earliest works Leubald and Die Feen as archetypes of a lifetime’s output and boxes our ears with premature references to Nietzsche or Schopenhauer. The search for creative consistency thus ignores the organic development of the artist and undermines the power of aesthetic renewal, which is so central to Wagner’s oeuvre. Part of the difficulty may well be situated in Geck’s copious reliance on (auto)biographical narratives from Wagner’s entourage. The study does open with a warning against the pitfalls of such sources (more specifically, against Cosima’s coloured and censored account of her marriage to Wagner). Nevertheless, Geck hesitates to acknowledge the pragmatic intentions of writings like Oper und Drama (1851) or Eine Mittheilung an meine Freunde (1851), of which we should be aware at all times that Wagner did not solely intend for them to divulge the new trails he was about to blaze; these texts also served the purpose of justifying his former dramas within the boundaries he had just set out to break. Luckily, Geck does not fail to provide a broader image than just that which Cosima and the composer himself fashioned. He complements these (auto)biographical texts with observations drawn from a small stock of authors such as Friedrich Nietzsche, Thomas Mann, Walter Benjamin and Theodor W. Adorno – prominent minds that influence our ideas on art as well as society until this day. Furthermore, each chapter refers to recent stagings of Wagnerian dramas and illustrates how modern directors translate Wagner to our times. In this way, Geck indirectly (and perhaps inadvertently) shows us the profound transformative force which Wagner retains to this very day and which transcends his life and music. To conclude, a short note on the translation by Stewart Spencer is in order. The translator was not confronted with an easy task: Martin Geck’s original text is written in a typical German academic vernacular with long-winded sentences and a vivid language. Spenser’s translation is very accessible and clean-cut without relinquishing anything of the matter’s complexity, resulting in an easily readable, pleasant and fluent text. Readers who adjust their expectations in advance will find a highly engaging and enlightening experience in Martin Geck’s Richard Wagner: A Life in Music. For pioneers venturing into the age, life and work of Wagner for the first time, the book is most certainly too far removed from a solid biography (although the orginal German title designates the book as a ‘Biografie’). Musical aficionados, on the other hand, will probably deem the analyses and information too brisk and superficial. Nevertheless, Geck succeeds in what he originally set out to do: to uncover the ways in which Wagner still holds a poignant mirror to the face of our own age and time. A better incentive to commemorate the composer’s 200th birthday can hardly be imagined.